Author of the best-selling book The Elements Theodore Gray demonstrates essential scientific principles through thrilling daredevil experiments. 'What a magnificent book. It's gorgeous, playful, and draws you in.' ?Adam Savage, cohost of Mythbusters 'Theodore Gray?has attained a level of near superhuman geekery that the rest of us can only mutely admire.' ?Cecil Adams, 'TheStraight Dope' 'Gray's encyclopedic knowledge and contagious enthusiasm transport us to deep intellectual realms while never sacrificing a sense of wonder and, above all, fun.' ?Oliver Sacks, author of Awakenings, Musicophilia, and Uncle Tungsten: Memories of a Chemical BoyhoodIn Mad Science, Theodore Gray launches a toy rocket using the energy released from an Oreo cookie, ignites a phosphorus sun by suspending half a gram of white phosphorus in a globe filled with pure oxygen and creates a homemade hot tub by adding 500 pounds of quicklime to water. These are just a few of the 54 experiments included in this astonishing book that demonstrates essential scientific principles in ways you were likely never exposed to in school. Every experiment in Mad Science is accompanied by full-color photographs that provide a front-row seat to rarely seen chemical reactions and glorious subatomic activity. To further enhance the hands-on experience, Gray includes step-by-step instructions for nearly every experiment. Following all of the safety guidelines, readers can even re-create some of the experiments in the book. 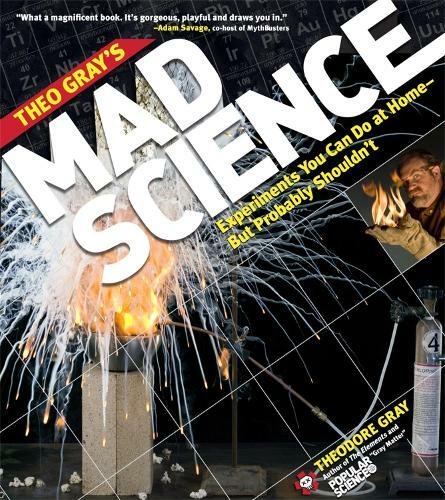 Mad Science is the perfect book for anyone fascinated by all things chemical, electrical, or explosive, and who loves a vicarious thrill. Adam Savage, star of "MythBusters"--Adam Savage"
Theo's MAD SCIENCE is destined to inspire and spark the imaginations of the next generation of makers, tinkerers, engineers and mad scientists! Phillip Torrone, Senior Editor of "Make "magazine--Phillip Torrone"
Theodore Gray has attained a level of near superhuman geekery that the rest of us can only mutely admire. Cecil Adams, "The Straight Dope"--Cecil Adams"
I've spent 22 years working with Theo Gray on creating software, seeing him find simple ways to do the seemingly impossible. You're in for a treat here when he applies the same creativity and insight to revealing the science of everyday things. This is a fabulous book, and a real education, too a beautiful introduction to hands-on chemistry. Theo Gray brings us dozens of experiments in minute, clear, and loving detail, and each one becomes a door onto the marvels of how chemicals react. Whether he is showing us how to make table salt from its violent elements, or, in a quieter vein, to make one s own nylon thread or lead pencils, Gray s encyclopedic knowledge and contagious enthusiasm transport us to deep intellectual realms, while never sacrificing a sense of wonder and, above all, fun. Oliver Sacks, author of "Awakenings," "Musicophillia," "Uncle Tungsten," and many others--Oliver Sacks"
"Theo's MAD SCIENCE is destined to inspire and spark the imaginations of the next generation of makers, tinkerers, engineers and mad scientists!" ?Phillip Torrone, Senior Editor of "Make "magazine Phillip Torrone"
"What a magnificent book. It's gorgeous, playful, and draws you in. Every single photo shows not only a deep love of science in the abstract, but also a tinkerer's love of the STUFF of science; the tools and glass, the clay and metal, and all the things that make science accessible to everyone." ?Adam Savage, star of "MythBusters" Adam Savage"
"This is a fabulous book, and a real education, too ? a beautiful introduction to hands-on chemistry. Theo Gray brings us dozens of experiments in minute, clear, and loving detail, and each one becomes a door onto the marvels of how chemicals react. Whether he is showing us how to make table salt from its violent elements, or, in a quieter vein, to make one's own nylon thread or "lead" pencils, Gray's encyclopedic knowledge and contagious enthusiasm transport us to deep intellectual realms, while never sacrificing a sense of wonder and, above all, fun." ?Oliver Sacks, author of "Awakenings," "Musicophillia," "Uncle Tungsten," and many others Oliver Sacks"
"Theodore Gray has attained a level of near superhuman geekery that the rest of us can only mutely admire." ?Cecil Adams, "The Straight Dope" Cecil Adams"
What good is this Nobel Prize around my neck if it doesn t produce admiration for science writers such as Theo Gray, whose skillful work helps convert young students into serious researchers. Leon Lederman, winner of the 1988 Nobel Prize in Physics--Leon Lederman"
"I've spent 22 years working with Theo Gray on creating software, seeing him find simple ways to do the seemingly impossible. You're in for a treat here when he applies the same creativity and insight to revealing the science of everyday things." What good is this Nobel Prize around my neck if it doesn't produce admiration for science writers such as Theo Gray, whose skillful work helps convert young students into serious researchers."